Halloween is right around the corner, and to celebrate we’ve got some scary good discounts coming to PlayStation Store. Starting tomorrow we’re putting new titles on sale each week for the next two weeks. Pick up some of our favorite zombie and horror themed games at up to 65 percent off. PS Plus members get some added savings, receiving up to 80 percent off. Check the Store tomorrow for this week’s discounted games and on October 29th for the second week’s lineup. Pick-up these awesome games, including recent releases like The Last of Us and Puppeteer, along with older favorites like Dead Island and Red Dead Redemption: Undead Nightmare, while they’re on sale because these savings won’t last forever. In addition to all the games on sale, we’ve also got a ton of movies and TV shows available at up to 50 percent off. Here’s a sampling of some of the zombie and horror movies and TV shows you’ll be able to pick up over the next two weeks. Don’t forget that the Get $10 for Every $50 Spent promotion is running through October 29th. For every $50 you spend using your SEN Wallet, you’ll receive a $10 credit back (up to $100). 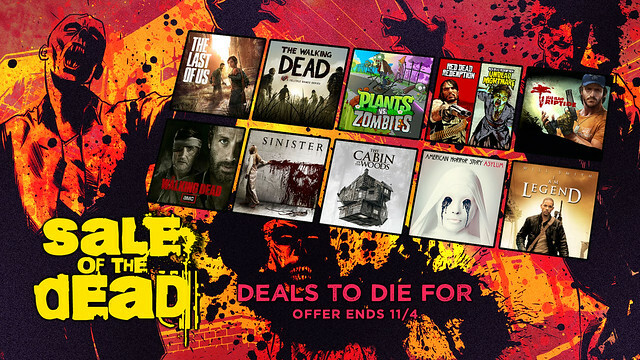 That means for the first week of the Sale of the Dead (10/22 through 10/28), you can take advantage of even more savings. If you’re not a PS Plus member, pick up a 1-year PS Plus membership this week for $49.99, get $10 back and get up to 80 percent off games that are part of the Sale of the Dead. There is no shortage of terrifyingly-good discounted games, movies and TV shows to choose from over the next two weeks. Let us know what you’re planning on picking up in the comments below. Wow, finally Red Dead Redemption Bundle on sale. THANK YOU GUYS!! These deals are terrifyingly low, I can’t wait to pick up Red Dead and Undead nightmare! The best sales ever! go go go!!! Does the “Get $10 for every $50” promo end as of the beginning of the day on the 29th, or will we get a chance to buy things after the store update? Now THIS is a sale! Was holding out to get some of the Fatal Frames for cheap for Halloween! Buy Puppeteer folks, it’s a steal at that price. YES! I was waiting for something like this! Great deals! I own like 10 of those games (Steam), but with those prices, I’m buying like 7 of them for my PS3. Thank you, Sony! Puppeteer it is. Nothing else strikes my fancy. Considering I don’t care for zombie or horror games, to think I found something on sale. Damn good prices on The Last of Us and Red Dead. If I didn’t have both on-disc already I’d definitely grab them. A sale on The Last of Us Season Pass would have been a nice addition. Just to be absolutely sure. Is tomorrow the last store update that we will be able to take advantage of the $10 back from $50 deal? Will the sale disappear after the store update on the 29th? Very awesome! In for RDR+Undead Nightmare and The Last Of Us! Also Buy Puppeteer, It’s a masterpiece of storytelling. DO YOU EVEN WANT MY MONEY? Would buy Dead Island GOTY edition but online is totally broken on the PS3 version. Me and my friend tried for hours to play co-op online. We have discounts posted every week in the PLUS section and in teh On Sale Now section. Make sure to check them out regularly. We also offer awesome Day 1 Digital games on pre-order. Checks out the exclsuive offers on Batman Arkham Origins, Battlefield 4, and Assassin’s Creed IV Black Flag both coming out this month. Puppeteer seems out of place.. but I haven’t played it at all. Also, DMC and the two Bioshock games. Five years and this is the first time The Last Guy and Siren have seen a price drop, even temporary. This is kinda insulting, Siren was a quality series and they just forgot about it. Well, here’s hoping it gets more exposure. Nice sales – Last of us is real tempting. I just finished Lone survivor. It’s the perfect title for Halloween. Great game! i apologize in advance for this doesn’t have to do with the sale but since u work in Digital Distribution, ESRB has rated Gex: Enter the Gecko for PS Vita and PS3. I’m really hoping this is the next PSone Classic to come to PSN. Are u able to say anything? If not, I understand. Yeah, I wanna know if the 29th will be the last day of the “spend $50, get $10 back” offer. I hope it is, but since the store updates kind of late here (around 5 or 6 ET) I’ll have to hurry up to buy the games I want. Please, keep that day as the last one. I’m pretty sure many of us will buy games from these deals to get the 10 bucks back. And with that spend $50 get $10 promotion still going on, this will be even more tempting. Amazing deals Sony! Thank you! I will be double dipping on The Walking Dead and buying it for the Vita! Only finished the first 2 episodes on the PS3. Will have to finish it off on the Vita. Scratching my head as to why I didn’t finish it because I loved it. To many games I guess! Everyone should get Puppeteer. It was one of the best games this year. Loved every second of it. Will the Sleeping Dogs Nightmare in the North DLC be on sale by itself? I picked up Sleeping Dogs when it was on sale a couple weeks ago so I don’t need the bundle, just the DLC. Thanks. Awesome! Fantastic sale! Are there any issues with buying the Season Pass of The Walking Dead now? I seem to recall people saying there were issues with that when they already received the first 2 episodes from PS+. @32 I’d like to know that as well. Please Sony, make the 29th still valid for the $10 cashback deal. Amazing sale. Definitely picking up the Fatal Frame games + RDR. Also, fellow Move owners, I highly recommend the House of the Dead pack! Two weeks of sales and only 3 games for the Vita? Please tell me I am seeing this wrong. On the spend $50 get $10 back through the 29th. Do purchases made on the 29th count, can we buy things released on the 29th? What time and timezone does the sale end? The sales pricing discounts on the films are HORRIBLE. Most of these films can be found in $5.00 DVD bargain bins at retailers nationwide. I think I’m going to buy the rest of the walking dead episodes I don’t have and Puppeteer. And once again if you don’t already own it I highly recommend Costume Quest. One of my top 3 PSN games. overall, a very weak sale. Where is the Vita support? @42 Major_Hoare, I’d also love for someone smarter than me to explain to me why Sony sticks to such inflated film prices. Even in a big sale like this they can’t try and tempt us to buy a movie for 1 or 2 dollars? Correct me if I’m wrong, but when you make a product be it a movie or a game, and you release it digitally, every single copy sold should be extra profit. I can’t figure out why movies can’t have good sales on PSN. Very nice sales! I have still have not finished beyond and my ps4 is coming soon loll. Bah I will at least get puppeteer I was planning to anyway and maybe some extras. Whoa, Puppeteear for half price? I wanted to get it with the pre-order discount but couldn’t afford to. I guess this is the time to get it.